After 7½ years of holding weekly services at Hastings Middle School, the congregation of Upper Arlington, Ohio, Grace Brethren Church (known as UA Grace) has a place to call home. They celebrated the grand opening service in their new facility at 4065 Kenny Road on Palm Sunday, April 5. 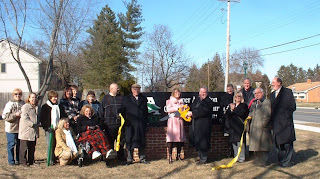 At right, Pastor Dave Bogue and a representative of the Upper Arlington Chamber of Commerce, center with scissors, cut the ribbon celebrating the new home. The church purchased the property, which was formerly owned by the Christian Apostolic Church, in May 2008. The 2.82-acre site with a 7,860 square foot building is located near the corner of McCoy and Kenny Roads. Over the last several months, the church family has renovated the facility. “Finding this property in Upper Arlington is definitely an answer to prayer,” said Bogue. “We searched for the right property for years and are very grateful to have a permanent location for our church. Our new church home will help us establish deeper roots in the community and be accessible throughout the week,” he added. UA Grace was established in 2001 by several families in Upper Arlington, a suburb of Columbus, Ohio. The first service was held on September 30, 2001 at Hastings Middle School. Since then the congregation’s weekly attendance has grown to approximately 180. Services are held Sunday at 10 a.m. Child care and children’s Sunday school are provided.